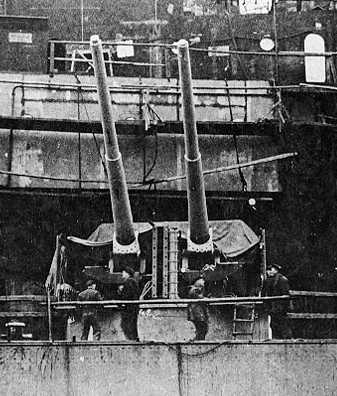 15 cm/55 (5.9") mounts on Scharnhorst or Gneisenau. The weapons at a 40 degree angle are 10.5 cm/65 (4.1") SK C/33 AAA. U.S. Naval Historical Center Photograph # NH 97507. This weapon was used on the German Panzerschiffes and Battleships in both twin and single mounts and was considered to be quite successful. However, the German practice of using separate single purpose anti-ship and anti-aircraft batteries was wasteful of both space and weight. A number of guns were used as coastal artillery. Two twin mountings originally planned for the cancelled carrier Graf Zeppelin were emplaced by September 1942 in northern Finland in the Petsamo area. A further two twin mountings were used in Northern Norway near Finmark. This latter battery was moved in 1945 north of Tromsø. Following the German surrender, this battery was taken over by the Norwegians and then used as part of their coastal defenses at Harstad. 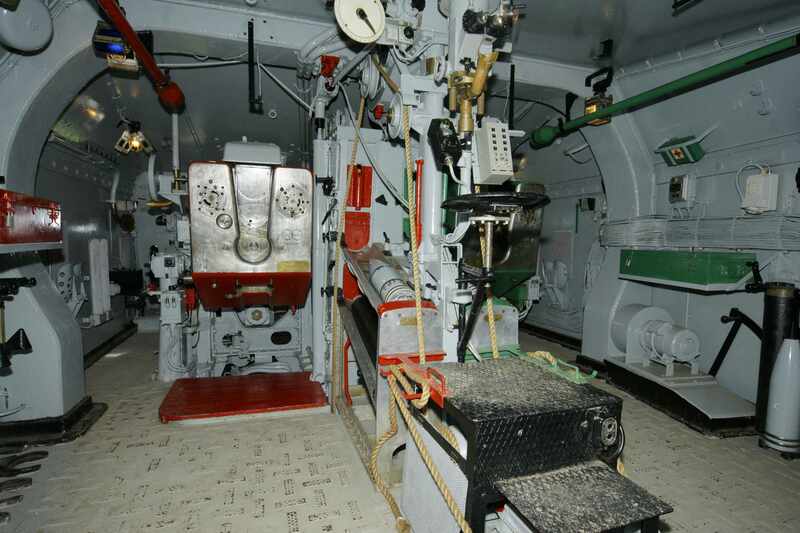 Some of these guns survived in active service until long after the end of the war. The small battleship Gneisenau was decommissioned and dearmed in 1943, with her guns then used in coastal fortifications in Denmark. In 1952, Denmark emplaced two of the twin mountings as coastal defense guns at Stevnsfort (Fort Stevns). These mountings were reduced to reserve status in 1984, but continued to be fired every year during training exercises. They "were fired for the last time in the summer of 2000, ending their operative career with an HE war-shot from turret no 1, driven 17 kms into the Baltic Sea and raising a column of spray to a height of 150 m, the shell detonating at an approximate depth of 17-18 m, according to the commander of the fort at the time." The fort was officially deactivated in 2001 and now exists solely as a museum. The main components of this gun were the loose barrel, a jacket and a breech end-piece with a vertical sliding wedge breech. The breech mechanism was hand worked. ^Gun weight varied according to the grade of steel used. ^References differ as to what ammunition was used for these weapons. For the most part, it would appear that these 15 cm (5.9") SK C/28 guns used similar projectiles as used for the 15 cm (5.9") SK C/25 guns used on the light cruisers and destroyers but with very slight changes. Both the projectile length and weight for each type appears to be identical to that for the similar type used for the other gun, so do not use the Lange (Length) designation as being the true length of these projectiles. See 15 cm/60 SK C/25 for sketches of the projectiles used for the light cruisers and destroyers; the projectiles used for the SK C/28 gun would be nearly identical. 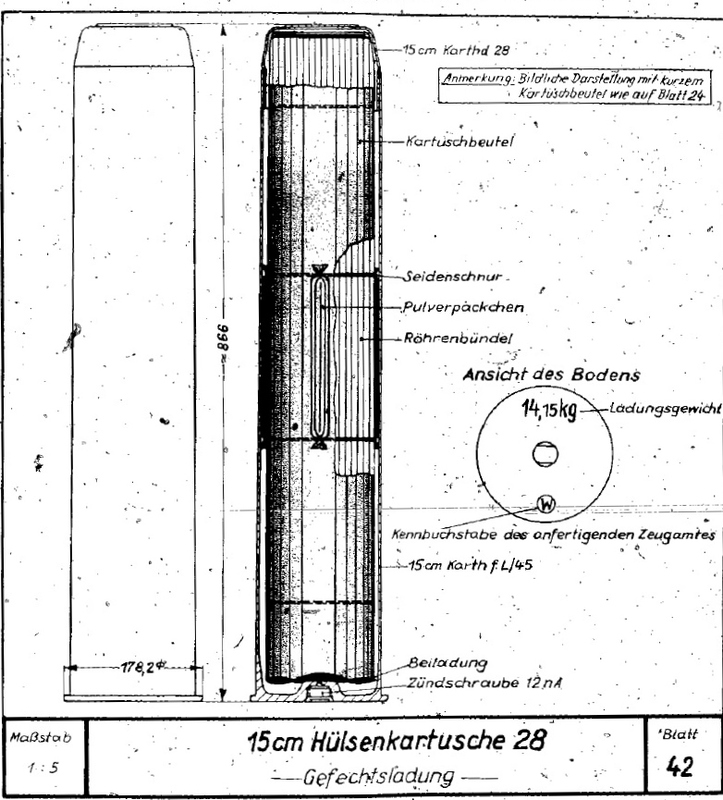 ^The post-war USN NAVTECMISEU Technical Report #191-45 "Standard German Projectile Fuzes" lists the time fuze Z.Z. S/60 nA as being used on the 15 cm Spgr L/4,6 Kz (m.Hb) which implicitly means that sometime during the war an AA version of this projectile was issued. The AA projectile was the same as the standard HE Nose Fuze projectile, but had a time fuze in place of the instantaneous impact fuze and did not use the ballistic cap (windshield). See sketch on the 15 cm/60 SKC/25 datapage. ^A Note on Sources: "German Naval Guns: 1939 - 1945" claims that fore charges were used for these guns, but I have found no other source that supports this claim. An examination of M.Dv. Nr. 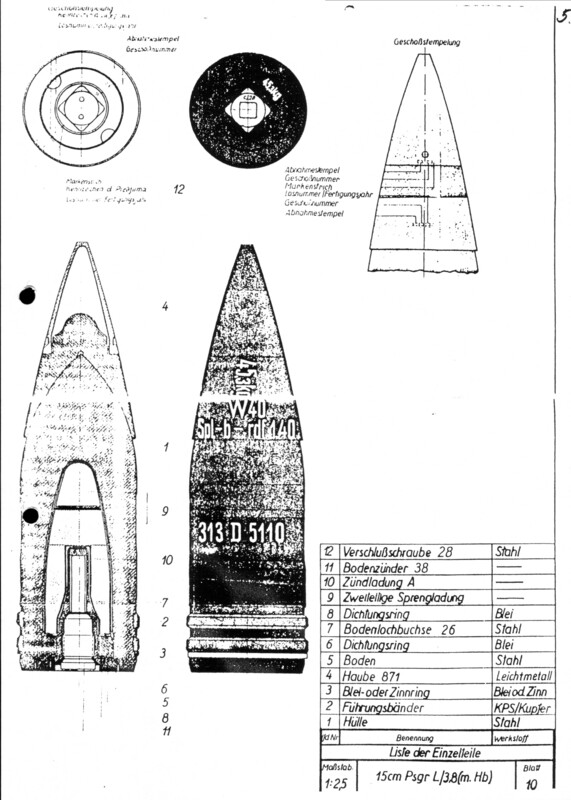 190,4A6, the Oberkommando der Kriegsmarine technical document regarding fore charges (Vorkartusche), finds no listing for this weapon nor for any other gun smaller than the 20.3 cm guns carried by the Admiral Hipper class cruisers. ^Outfits included APC, HE base fuze and HE nose fuze with and without tracer and illumination. However, APC was rarely carried. ^Single MPL/28 mounts on the Deutschland class were modified to add armor protection and some had double doors installed on the back of the open shield in order to provide weather protection to the gun and crew. The MPL/35 mounts on the Scharnhorst class were similar in design but roomier and had additional armor protection. ^The twin turrets did not have the guns individually sleeved. 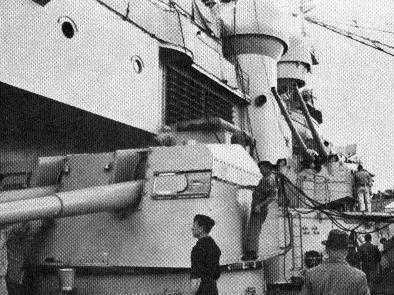 Bismarck and Tirpitz had one turret on each side equipped with a 6.5 m (21 feet 4 inches) rangefinder. ^Most of these mountings were designed to be able to make one complete revolution in either direction from the mid (fore and aft) position for a total of 720 degrees of train. Firing arcs were restricted to about -80 / +80 degrees for the battleships and about -150 / +150 degrees on the cruisers. 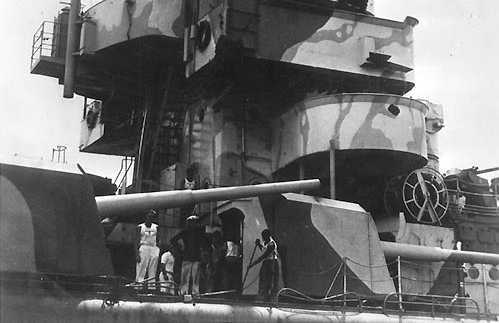 The gun axes were 68.9 inches (175 cm) apart in the twin turrets and 31.5 inches (80 cm) apart in the twin casemate mounts. Port forward 15 cm/55 mount on Bismarck under construction in 1939. U.S. Naval Historical Center Photograph # NH 83984. 15 cm/55 mount on Bismarck. In the background is one of the 10.5 cm AA mountings. 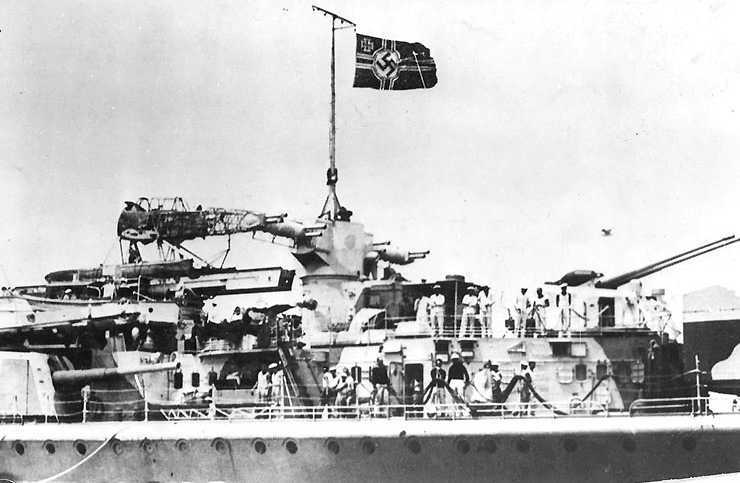 15 cm/55 guns on Admiral Graf Spee. Photograph taken at Montevideo, Uruguay in mid-December 1939, following the Battle of the River Plate. U.S. Naval Historical Center Photograph # NH 59659. After superstructure of Admiral Graf Spee showing 15 cm/55 and 10.5 cm/65 guns. Note the burned-out Arado Ar 196A-1 floatplane on the catapult and the after main-director rangefinder. Photograph taken at Montevideo, Uruguay in mid-December 1939, following the Battle of the River Plate. U.S. Naval Historical Center Photograph # NH 80976. 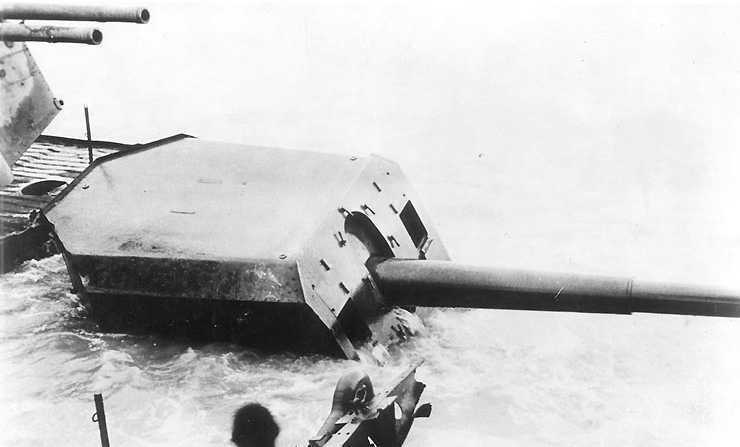 15 cm/55 gun on Admiral Graf Spee after she was scuttled. At upper left is a10.5 cm/65 twin mounting, a photograph of which may be found here. Photograph taken on 2 February 1940 by Ensign Richard D. Sampson, USN. U.S. Naval Historical Center Photograph # NH 50958. 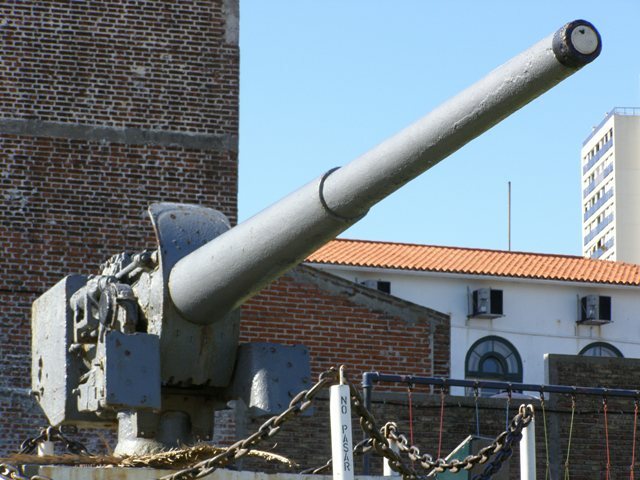 15 cm/55 gun salvaged from Admiral Graf Spee now on display at Museo de la Armada, in Montevideo, Uruguay. Photograph copyrighted by Federico Pedrido and used here by his kind permission. 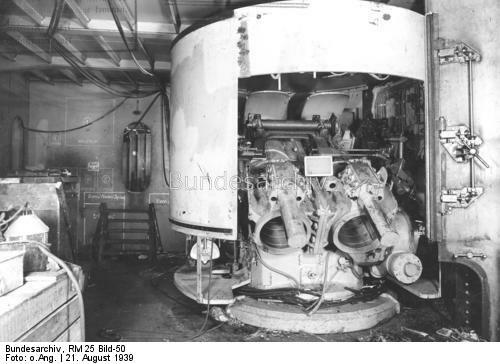 Twin 15 cm/55 Casement mount under construction on Graf Zepplin in August 1939. Bundesarchiv Photograph RM 25 Bild-50. Twin 15 cm/55 SK C/28 mounting formerly on Gneisenau now at Stevnsfort in southern Denmark. Photograph copyrighted by Caspar Vermeulen and used here by his kind permission. Interior of above mounting. Photograph copyrighted by Caspar Vermeulen and used here by his kind permission. Right gun of above mounting. Markings on this gun indicate that it is serial number 1015 and that it was manufactured by Rheinmetal/Borsig at Düsseldorf. Photograph copyrighted by Caspar Vermeulen and used here by his kind permission. 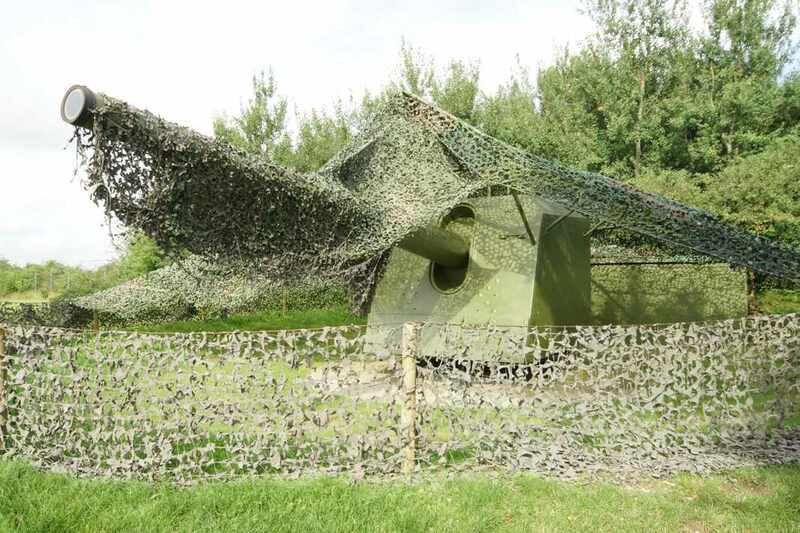 Single 15 cm/55 SK C/28 mounting formerly on Gneisenau now at Stevnsfort in southern Denmark. Photograph copyrighted by Caspar Vermeulen and used here by his kind permission. 15 cm APC L/3,8. Sketch from M.Dv. Nr. 190,1A1. 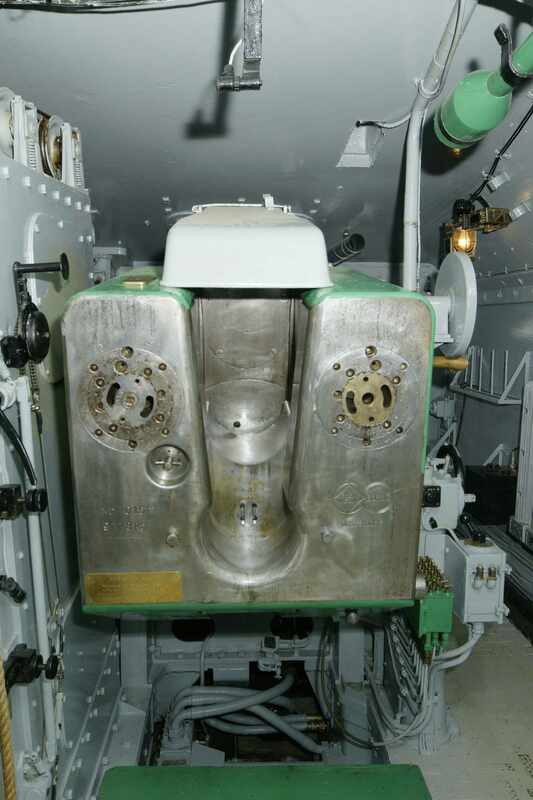 Propellant casing (Hülsenkartusche) for 15 cm SK C/28 guns. Sketch from M.Dv. Nr. 190,4A1. Letter by Arne Ingar Tandberg in "Warship Volume X"